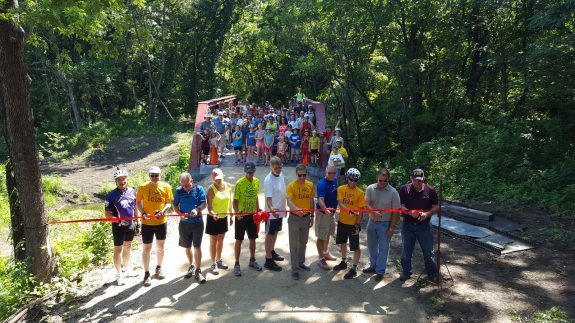 The Lehigh Portland Trails held their grand opening ribbon-cutting celebration last weekend in Iola. The new trail system features about 2 miles of wide gravel trails (including segments on three historic rail lines — the Missouri-Kansas-Texas (MKT), the Missouri Pacific, and the Santa Fe), 5.5 miles of singletrack trails, a century-old bridge, impressive scenery along Elm Creek and around the 100-acre spring-fed lake, all on the grounds of what was once the largest Portland Cement plant in the United States. It is a rare example of a trail system that includes both rail-trail style gravel trails and natural-surface singletrack. With the opening of Lehigh, Allen County has now added over 20 miles of new trails in the last decade — the Prairie Spirit Trail in 2008, the Centennial Trail in 2009, the Southwind Rail Trail in 2013, the Missouri Pacific Recreational Trail in 2015, and now the Lehigh Portland Trails. The trail network is not only an important recreational and transportation resource for residents, but positions Allen County as one of the top trail destinations in Kansas. Our unique mix of trails, and a dazzling diversity of terrain and natural environments, makes Allen County an increasingly popular choice for people to visit, and a compelling destination for new businesses and residents who want to live and work in an active and health-conscious community. Iola and Allen County also hope to be a model for other small rural Kansas communities and counties. At the grand opening, the Kansas Trails Council announced that the group was donating one of their Trail in a Box trailers to Thrive Allen County, permanently, with the hopes that it will become a resource for the entire Southeast Kansas region, and spark a new wave of trail-building projects. The trailer, one of four in the state, is outfitted with all the tools and equipment needed to construct and maintain natural-surface trails. 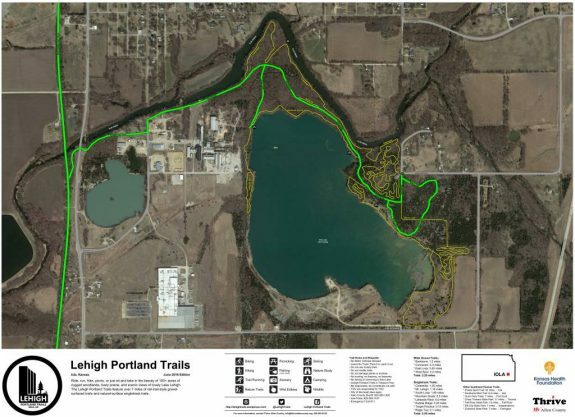 It will now remain in Allen County, and will also be available for other trail projects in the area. Thrive also announced that the Sunflower Foundation has awarded a $30,000 grant to the City of Iola towards construction of the “King Of Trails Bridge”, a bike/ped bridge that will span Elm Creek at Washington Avenue, providing a more direct connection between residential areas in Iola and the recreational and employment opportunities south of Elm Creek, including the Lehigh Portland Trails. Learn more about the Lehigh Portland Trails at LehighTrails.com.